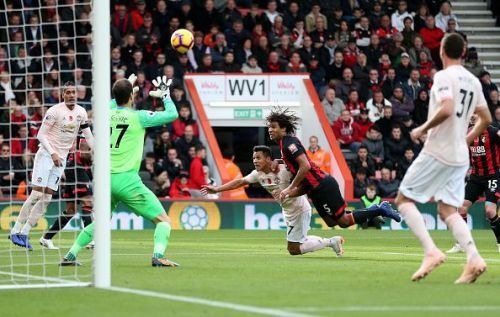 Nathan Ake kept a faltering Manchester United attack at bay for all but two moments in the game, and that cost Bournemouth. Manchester United team news came in an hour before kickoff, and it was revealed that Romelu Lukaku was not included in the matchday squad due to a mysterious injury he suffered in training leading, which the manager said: "needed to be examined in the coming few days." While the big Belgian hasn't scored since early September, he is quite a menace for the opposition defenders with his pace and strength which allows others around him to have a larger impact, but he was not playing, which would have given Bournemouth the perfect opportunity to shut out their opposition, who have been struggling lately. But Nathan Ake, who otherwise a very solid defender, faltered twice in the afternoon which led to Manchester United first levelling, and later scoring the winner. Ake was brilliant in shutting out spaces for Sanchez to run into, but failed to track his run once, and was punished in the 35th minute, and failed to clear the ball in the 92nd minute, and was duly punished by youngster Marcus Rashford.